My reader, Cartophiliac, found the link to a map- and yes- Ohio is on it. It seems Obama didn’t ignore us, just the New York Times. However, there are comments, and some info about the Greyhound station moving- so this post will remain. 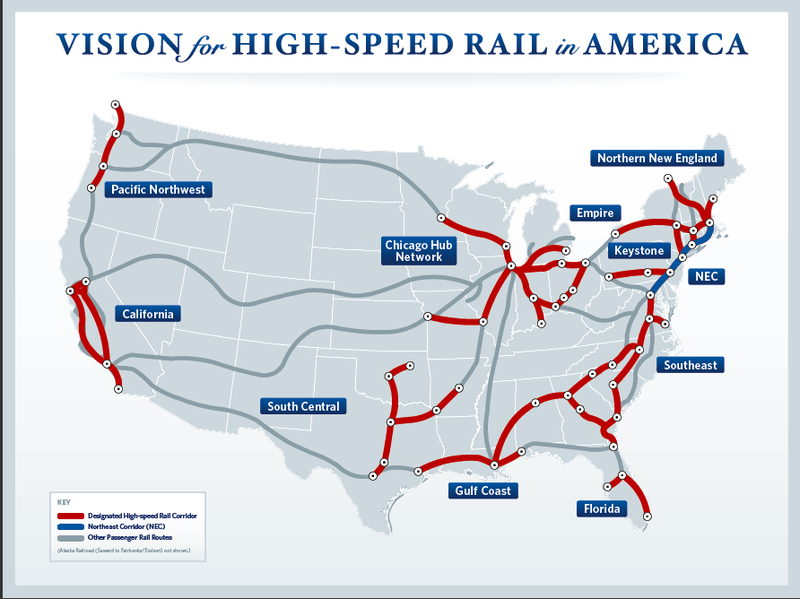 We’ve talked about a high-speed rail plan in Ohio for years. Now, when the Federal government is ready to push this green technology, Ohio isn’t ready with plans to put us on the map. The government has identified 10 corridors of 100 to 600 miles in length with greatest promise for high-speed development. They are: a northern New England line; an Empire line running east to west in New York State; a Keystone corridor running laterally through Pennsylvania; a southeast network connecting the District of Columbia to Florida and the Gulf Coast; a Gulf Coast line extending from eastern Texas to western Alabama; a corridor in central and southern Florida; a Texas-to-Oklahoma line; a California corridor where voters have already approved a line that will allow travel from San Francisco to Los Angeles in two and a half hours; and a corridor in the Pacific Northwest. via Obama Unveils High-Speed Rail Plan – NYTimes.com. In Dayton, we’re having a whine fest over relocating the Greyhound terminal- missing the point completely that inter-modal transportation is the future. Instead of discussing putting the Greyhound terminal in the new parking facility at the Airport, and running RTA buses to the airport. We have people unhappy that Greyhound might move to Trotwood. In the meantime, bus transportation is making a comeback- in Cincinnati, with the Megabus. An associate just went to Chicago via Megabus, with wi-fi at her upper deck seat for $39 one way. Had she booked earlier- it could have been less. It’s critical for Ohio’s future to have solutions that aren’t based on cars. Right now, our elected officials should be scrambling to Washington to get our high-speed rail line on their radar. Ohio —most of it—is a dying state, so I can see why the Feds would hesitate to invest much here. Did you actually look at the high speed rail plan that you linked to? The map within the plan clearly shows Ohio in the midwest Chicago Hub network. Just because the NYTimes didn’t bother to notice Ohio, doesn’t mean we aren’t here. Ohio is part of the current plan. Thanks for the link, however. I loves them maps! @Cartophiliac- Apparently, I’m an idiot. Took me a few to find the link to the map. Obama didn’t ignore Ohio, just the New York Times. Not an idiot. Just a human. I think the best reason to consider keeping the Greyhound station downtown, is that it might be near the proposed 3-C station in Dayton, making it easier to transfer. WOW! A political candidate that owns up to a mistake! Admits an error and moves on with business as usual. That is a very rare thing indeed. We need more people of this caliber in City Hall! Kudos to Mr. Esrati. If Dayton’s city leaders allow the Greyhound to move out of downtown, either to Trotwood or to the new airport parking garage or wherever, they’ll deserve it if the new high speed rail station is also not downtown (though I’m not holding my breath that America will ever have high speed rail service). Jeff, I wouldn’t say Ohio is dying. It’s in a state of transition. Life and death are all part of transition. Sorry to get all Buddhist on you. As far as Greyhound goes did you know 40% of the current ridership is from Trotwood? Well, that’s one of of putting it. Dying is a pretty loaded word. But if there is an ongoing decrease in population and jobs I’d say maybe <i>shrinking</i> would be a better word. OK, or transition. Actually, that hub up there off Shiloh Spring Road (I think) probably is big enough to be modified into a Greyhound station. I am probably one of the few folks here who used to ride Greyhound fairly regularly (back in Kentucky). My granparents used to ride it, too. hahaha…What else could he do? The fundamental point of the post was wrong. Kinda hard to ignore that. @ Gary – could you and Mr. Esrati possibly just GET A ROOM??? Neither of you stands a chance so please once and for all, get a grip. Could you possibly GET A LIFE? You’ve posted nothing substantive on this board. only rearing your head to spew vile whenever it suits you. Vile? That’s hardly the proper term for accurate predictions of the November outcomes. But thanks for recognizing that I choose to share my time and talents in more worthwhile venues. I’ve attended a couple of the rail initiative meetings. The current plan proposes an initial service travelling 80-90 MPH using and sharing existing rail lines while the high speed service is being built. No information is available for how many stops there would be on the initial Cleveland to Cinci run, or how local development would play into the stations, or local stops would hub in. I often get lumped in with the Dayton boo birds for being a skeptical cat that spouts absurdities while I pull out what’s left of my hair in frustration but really!? Unless someone stages these train cars as rolling luxury wagons the only incentive for rail travel (green is being highly touted) is not having a car. If you can make the trip in less time by car, why take a train. Using the exiting rail lines as startups also blows infrastructure development opportunities. When I asked why a true high speed test run train isn’t being built between Wright Patt and Columbus, (shorter run, designated purpose, state of the art train, new infrastructure) the “existing start up rail “line” was repeated. The Moraine truck and bus plant is also being pulled into this discussion as a potential rail car construction site for all those states looking at rail travel. Try getting any info on where GM or Moraine is in making any of that happen or finding any coalition of power brokers with enough clout and intent to bring all the talkers to the table to “git er done” . All Aboard Ohio is attempting to move this as an issue. Some people enjoy driving on expressways so much, they wouldn’t be interested in an alternative… I’m certainly not one of them. They would need to market by emphasizing the convenience of NOT driving. Thank you sir, for some well considered commentary, and some cogent points. You have in fact touched another demographic the rail folks do see as critical supporters. Would there be sufficient numbers of those kinds of riders? Progress likes to project towards the positive side and rail advocates do have polling data suggesting ridership would be strong. Between the wait to get the trains up and running and the travel times I’m not quite there on the sunshine train with you. I see the new infrastructure development aspect of true high speed rail as a significant jobs generating ODOT project . Incremental runs constructed between major cities could would generate buzz for ridership. and outlying municipalities could begin developing short rail hub connectors. The major cities stations could track the raised trains through brownfields, and terminate underground in the center city. Think of Columbus Center City Mall as a train station, or the renewal of downtown Dayton with the return of a major train station hub. Or joining amenities like the Rock and Roll Hall of Fame to the Newport Aquarium. Riverside Ohio already has development plans for a multi use facility on the books in anticipation of a train stop adjacent the Air Force museum. I really think this should go in as a true high speed from the git go using an elevated mag train instead of half stepping over the same am0unt of time and ending up with a deisel running on tracks. I’m not riding any “sunshine train”. I can be as skeptical as anyone. All I’m talking about is ME and why I would like such a thing to happen. I would use it. Maybe others would too. But I’m not a politician. So I won’t make it happen. I’m kinda lost in your comeback there dude?! I’m not a politician either but I am trying to make it happen. I am actively involved in groups that are pursuing and promoting rail development, looking at the Moraine truck and bus plant as a possible passenger car manufacturing facility. I expect to be in Columbus tomorrow for a day long Ohio rail conference. I’m glad to hear that you would ride the train, and I would too, just as I have ridden trains from Berlin to Frankfurt to Paris and Amsterdam and back, Dayton to St Louis,… when they still ran and there was a station,…that six hour drive took me 14 hours on the train. As for the “sunshine” crack,…I guess I just should have said that my fear was insufficient number of riders, and that research done at one point in time doesn’t always stand up over time instead of trying so hard to be cute with language and leading people to believe that I wouldn’t ride any train that didn’t run on my plan. That’s all I was referring to. Intentional or not, it was a sarcastic put down, implying that I do not recognize the realistic chances for this to work. You clearly do, and I applaud your efforts.